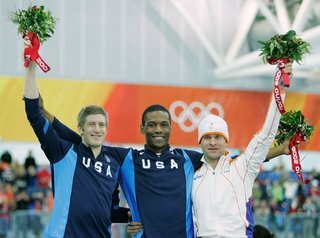 Chicago native Shani Davis, won a gold medal in the 1000m speed skating relay at this year's Olympics. I searched but could not find a press release on Shani winning the coveted postion in history so I have included links to info about Shani. It was reported that Shani was the first African-American to win an individual gold medal in the winter Olympics.There was a little controversy about his lack of participation in a non-required team speed skating event but he said he couldn't be distracted from winning. Since he made history by winning a gold medal in his event,it makes sense to me. *good thing that he won* What ever happened to good sportsman like behavior? Why couldn't his fellow American Olympians be more supportive? I'm glad he had sense enough to prioritize. I tried ice skating once. I mostly clung to the wall. I remember thinking that I didn't relize ice was that slippery. I didn't fall but I sure wasn't doing as well as my practices in the changing room, while standing on the carpet. Congratulations, Shani on your win. Maybe you can teach me how to skate one day. MAKE SURE YOU PULL DOWN SOME ENDORCEMENTS!